In his filing, Leon claims that the ship Toucan, which was docked at the island, came loose during the hurricane and started drifting north into the Intracoastal for a strangely wild ride for a distance of more than two miles. When the vessel, described in U.S. Coast Guard registries as a 36 .8-foot barge, slammed into the sea wall of businessman Leon’s property at 45 E. Rivo Alto Dr., on the Venetian Causeway’s Rivo Alto Island, it allegedly took out his dock, boat elevator and pilings, and dented the sea wall. The case file doesn’t mention an amount of damages. 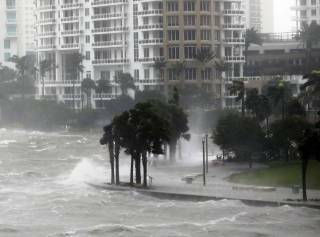 Waves crash over a seawall at the mouth of the Miami River from Biscayne Bay as Hurricane Irma passes by on Sept. 10. “Obviously, we believe Fisher Island had plenty of time to prepare and should’ve taken the boat into the mangroves or up the Miami River,” Obront said. “That’s what everybody else did. It wasn’t a good idea to leave it at Fisher Island, ground zero in case of storm." Said Brian Scarry, Fisher Island’s attorney: "It is the policy of the Fisher Island Community Association to refrain from commenting on matters before the court." But in his response to the complaint, Scarry claims Leon, not the association, failed to prepare appropriately for the storm.